February 20, 2014 by Sue Mitchell, Aeona Limited. This is a real example of two bosses I had and their dramatically different approaches to their leadership for the research projects I had been hired to run as a post-doc fellow. Both projects had been funded to achieve a particular objective and both required a fairly specific methodology to be followed. In my first fellowship, the boss invited me to a meeting to discuss the project. He explained how this project was to complete the work started by a PhD student who had left after 2 years research. My project was to extend the research to a wider geographic area in a way that meant we could make direct comparisons with the PhD student’s research and analyse all the data in a meta-analysis. He asked me to come up with a plan that would best address these constraints and deliver the outcomes we wanted. In effect, we both knew that this meant the style and nature of the experiments was already determined as it needed to be exactly the same as the experiments previously conducted by the PhD student, because this was the only way to make the data directly comparable. However, at no time did my boss mention anything about the details of how to conduct the experiments. He left it to me to do all the design and details, which we discussed at our next meeting, and agreed the standards and outcomes required. In our subsequent meetings, he asked me about progress, results and my interpretation and how well (or not) I thought these indicated we were on track to achieve the project outcomes. The effect of his approach was to make me feel respected for my knowledge, expertise and professionalism. It made me feel ownership of the project and responsible for delivering results. I felt hugely motivated, committed and engaged in my work and I devoted (far too much!) time to ensuring we got great results. My boss of my second fellowship was very different. Again this was a project that had been funded to achieve a particular aim. The boss and a third person had designed the project in order to apply for the funding. They invited me in for the first meeting to discuss the project, and described in full detail exactly how the experiment was designed and to be delivered. They hired me, they said, for my expertise in working with the system that was being used but would not listen to any of my concerns around implicit assumptions that were being made but not acknowledged. These assumptions meant the biology in the system would create too much variability to be able to detect the results being sought. I felt they were treating me like a technician and wondered why they had hired a postdoc in order to do a technician’s work. In the end, I never had a real conversation with this boss until I gave up trying to speak with him and just started saying ‘yes’ to doing it his way. The boss called regular meetings to discuss the details and how I was conducting experiments. I was extremely demotivated, I didn’t trust my boss and this was the most disappointing job I have ever held. On the other hand, the prospect of potentially getting another boss like this was one of the triggers that spurred me to leave academia, so perhaps he did me a great service after all! How effective were the two bosses’ leadership styles? The first boss was effectively managing at a level to manage other people, especially experienced professionals. His time investment in the project was 1) at the beginning clarifying the overall desired outcomes and standards and 2) in key meetings. It resulted in the appropriate project design and delivery and a committed and engaged researcher. Although he could have given me all the details the second boss gave me, he didn’t. He held back and let me sort out the details. The time invested in creating the detailed structure for this project was all done by me, the professional – which was appropriate. The style was very much outcome focus, which enhances and can further develop the professional’s expertise and ability to project manage. It was an ideal style for someone who manages others to still be responsible for outcomes but deliver them through other people by delegating appropriately. Note delegation is not abdication. In this project, the outcomes were important to the boss’s reputation, so it was vital to ensure the results were valid. He shared responsibility, and agreed clear standards and reporting with me, the professional, so we both knew what was required to recognise when we were on track and delivering outcomes at the right level. Throughout this project, he did not get deeply involved in the operational side. He provided strategic direction and support, and at the same time showed respect for my expertise that resulted in commitment and engagement. This freed up his time to lead a larger number of people and also have time to conduct his own research, which provided his fulfilment to still feel like the ‘expert professional’ that he was. Note, however, that this style of leadership was not always appropriate at this extent of outcomes focus. His new PhD students sometimes felt overwhelmed and a few post docs also preferred to have more hands on input and direction. A little more flexibility to respond to individual needs could have paid dividends. The second boss was still operating predominantly at the ‘manage self or project’ level, rather than managing other people at the right level. He invested a lot of time overseeing the details of the work (the how) that could have been better invested in other things more appropriate to his leadership role. He did not have time for conducting research himself any more. He was heavily involved in the operational side of this project. The result was demotivating, disengaging, lack of trust and a struggle to find commitment. Now I know more about leadership and management I recognise this boss was using the ‘broken record’ technique on me during the first six months of my tenure. This is hugely demoralising. He never listened or responded to what I said, just kept repeating what he wanted to tell me. I highly recommend that you never use this technique if you want to develop good relationships with people and engage your team. Over the last few years in my role as an executive coach, I have subsequently worked with many managers to step up to lead and manage at the right level. They felt there just wasn’t enough time to do everything they were required to do in their role. They felt very time-stretched, no matter how well they managed time and scheduled their diaries. They felt it was unreasonable for one person to be expected to do all this – the role was too big for one person. Often their work/life balance suffered, they spent too long at work and took work home to finish off in the evenings and weekends. Their home life suffered and they had too little time for friends and family or sport or other personal interests. They were still getting too involved in the operational and technical aspects of their direct reports’ roles. They were deeply involved in the details and often telling their people how to do their job, in the way that was successful for them. They were doing this with the best of intentions, without realising how it could be destructive to their team’s morale, motivation, engagement and productivity. They felt this was what was needed and expected of them to provide direction for their team, which was their job as the manager. However, it didn’t leave them enough time to do their own work or focus on the far horizon and plan for longer term future strategy. Also, some found that they were not being seen as a peer by other managers at their level and people would primarily come to them for their expertise rather than strategic thinking. They were effectively still managing at the ‘managing self or project’ level rather than managing at a level to manage other people and managers. In effect, they were still ‘being the expert’ rather than the ‘leader of experts’. Being the expert brings satisfaction and fulfilment, perhaps a sense of identity, and values their knowledge, skills and technical expertise. Experts, or ‘individual contributers’, spend almost all of their time on work they directly control and value getting results through their own proficiency and delivering high quality work. This value has brought them success in their career to date but gets in the way of being an effective manager and leader of other people. 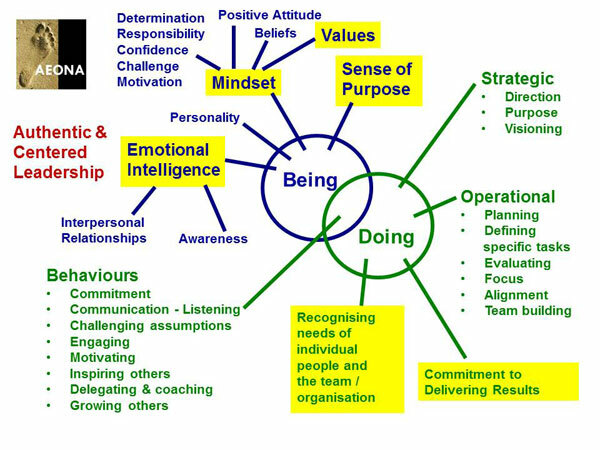 Becoming a leader of experts requires a shift in values – to value getting results through others not yourself, to value time spent in developing your people, to feel their success is your success, to value the outcomes and success of your team or unit, to value your managerial work and getting the best out of your people, to value yourself as a manager and leader rather than as a professional expert. The key is to getting the right balance of where you spend your time. The higher your leadership or management level in an organisation, the more your focus must be providing strategic direction and achieving results through others and less time being the expert working as an ‘individual contributer’. Shifting values doesn’t happen overnight! It takes time to develop awareness of what is most important to you and what motivates you. It involves developing a real and personal motivation to want to value your contribution in this different way. Many leaders find this difficult transition is much easier with support from a mentor or coach who they trust to explore their values, thoughts and feelings; plan how to try out new ways of thinking and behaving; and reflect on what’s working well or what could be changed. Sue Mitchell email: info@aeonacoaching.com telephone +44 1875 830708 or use the contact form below – please make sure you spell your email address correctly for me to be able to reply to you. December 11, 2013 by Sue Mitchell, Aeona Limited. 5 tips to maintain your positive mindset. 5 easy exercises you can put into practise right away. Thank you to Kim McAllister who asked for some tips on exercises to keep positive after reading my blog about mindset. As she noted, mindset is so important yet also very tricky to control. Here are some “easy to start right now” suggestions for how you can take control of your mindset. 1. Notice what is going well for you! How often do beat yourself up for not finishing half the things on your to do list? How often do you congratulate yourself for finishing half the things on your to do list? I suspect the first number is much higher than the second! Most of us take for granted everything that goes to plan, especially the smaller everyday things. We expect they should happen so we don’t acknowledge to ourselves just how much we achieve every day. Exercise: At the end of every day, write down 3 things (or more) that went well for you today, and your part in making it happen. 2. Celebrate your achievements. Now that you notice what is going well for you, celebrate it! Think of small ways you can celebrate the small things, and bigger celebrations for the big stuff. Choose something meaningful to you, it doesn’t need to be expensive! Maybe it is making “me time” if that is a scarce resource for you, time to reflect, or soak in the bath, or read a book, or go for a walk, or spending quality time with family and friends. Exercise: Write down a list of ways you can celebrate your achievements that will be meaningful for you and affordable for you to do often! Or more expensive but affordable and desirable to celebrate your really big achievements. Allocate these celebrations to things you will celebrate each day. 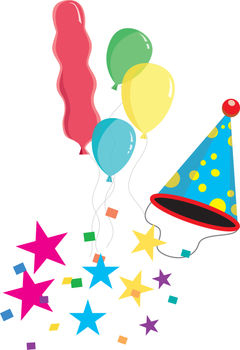 Put this list somewhere you will see it to remind you to celebrate! Invite your friends and family to join in this exercise with you – it’s a lot more fun to share. 3. Be proud of what you have done and who you are. When we hit a rough patch and we find ourselves compelled to put ourselves down and sink into our negative mindset, it is so useful to have something concrete to remind ourselves of why we can be proud of being who we are. Exercise: Make two columns on a large piece of paper. In the first column, write down your lifetime achievements. These are all the major things you have done in your life and things you feel proud of. Remember to include things from all areas of your life – education at school, and maybe college or apprenticeships or university, qualifications, work life, voluntary work, home life, your family, relationships, sport, hobbies, interests, your community, holidays and so on. In the second column, write down all the things you have achieved recently and include the smaller everyday things as well as bigger things. When you have done, share it with your close friends and family. Why not encourage them to do this exercise with you and celebrate your lists together. 4. Notice your self-talk. This is the mind chatter we say to ourselves throughout the day. How constructive is your self-talk? Would you accept that kind of talk from anyone else? Would you say that to your best friend? If you answer no to the last two questions, why are you doing this to yourself? Raising your awareness of your self-talk gives you the opportunity to do something about it. For many people, even being conscious and mindful of their thoughts helps to reduce how often they are negative. Exercise: Keep note of every negative thought you have throughout the day. Some people keep a notebook and just make a tally mark each time. Some people keep a tally on their mobile phone. Use whatever works best for you. Review each day and see if over the week your awareness of your self-talk helps you to reduce the flow of negative thoughts. 5. 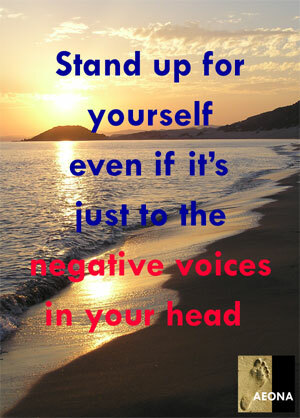 Challenge your negative thoughts and make them positive. When you have a negative thought, think about how you can counter that and change it to a positive thought. For example, you could turn “I made a real mess of that” into “I did my best and can learn some things from it”. Exercise: Add a second column to your self-talk notes and make a tally for every successfully converted positive thought. Review each day and see if over the week you have less negative thoughts and also change more of them into positive thoughts. 6. New Bonus Tip – practice and learn these with other people to really boost your success in making it happen! Are you near Edinburgh? Why not join the Ignite your Confidence seminar on 9th July 2014 and really add a positive zest to your life. Get it half price – click here and enter this code WPP1406 at the link above the register button Code to copy and paste: WPP1406. November 12, 2013 by Sue Mitchell, Aeona Limited. What do you mean by changing mindset? Your mindset determines your success, in any walk of life or aspect of your own life, at home and at work. Your mindset evolves throughout your life and can change from situation to situation. It is made up from many parts, including your experiences (and how you think about them), your thinking style, your attitude, your values, your beliefs, sense of purpose, focus of attention and so on. You have learned your mindset throughout your life so far, which is why you can learn to change it too. Did you know that professional and elite athletes attribute 90 – 95% of their success to their mindset. Even though we imagine that when athletes compete, it is their sports skills that are most important, the athletes themselves say the most important part of their success is their mindset, which includes their confidence in their abilities and their confidence that they can win. Two recent examples of this are Mo Farah and Andy Murray. Mo Farrah talked about how he used to want to win but in some part of his mind think his competitors were better than him and lose the race when they came up alongside him. Now he’s worked on his mindset and his inner knowledge that he can beat them and is going for it, he’s no longer focusing on the other competitors, he is focused on winning. He feels that confidence is like a weapon that gives you control, and you feel positive knowing you’ve prepared well. Andy Murray is another great example of a skilled athlete whose self doubts were the biggest barrier to winning. Self-doubt clouds your mind and focus with excessive negative thoughts about the outcome, not being good enough and so on. Andy’s ability in tennis was not the problem, he could pull marvellous shots out of the bag, but under pressure made more errors. Once he mastered his doubts and built his confidence, he could remain calm and focused under pressure. He won his first grand slam and then went on to win more. Modern developments in neuroscience mean they can now record activity in living brains with imaging techniques. The fundamental organising principle of the human brain is that we are designed to maximise rewards and minimise threats. Neuroscientists call this the ‘walk towards, run away’ theory. Since the consequences of threats can be catastrophic, the ‘run away’ pathways operate much faster and stronger than the walk towards neural pathways in the brain, so we can respond immediately we detect any potential threat. The neuroscience research shows that our thoughts of self-doubt and self-criticism create the same effects in our nervous system and stimulate the same ‘fight-fright-flight or freeze’ response as situations of physical danger. This is the part of our brain that says ‘get me out of here’ and takes over from the part of our brain that controls our rational thinking. It means we can’t think straight, make the best decisions, respond well or listen well. Imagine the effect that has on how you present yourself and how effective you are in any situation – whether that’s sport, in work, in a job interview, with a client, doing a business presentation or in your home life and communities. The neuroscience research shows that positive thinking rewires your brain (the official term is neuroplasticity). We can learn to focus our attention constructively and systematically alter brain circuitry underlying intrusive negative thoughts. Using mindful awareness, a self-observational skill, we can choose to respond rationally to emotionally stressful stimuli. We create new connections and the more you use them the stronger those connections become. After a while, you build a new good habit of positive thinking. but ONLY WHEN you are AWARE of it. A large part of our mindset is usually in our non-conscious mind, where we park the things we want to do automatically without having to think them through all the time – things like how to drive a car, our practical skills we use in our work or at play, our good habits and our bad habits. This is where we hold our values and beliefs, that we’ve absorbed over our lifetime from the people around us, especially family and people we hold in authority. When we first took them on board they were undoubtedly useful for us then. However, life changes, the world changes, and sometimes if we don’t change our mindset too, we become mismatched to the world we live in, resulting in frustration, fear, anger, anxiety, and other negative outcomes. This is why it is so useful to do a personal audit and raise to conscious awareness everything that influences our mindset and how we see and interact with the world. With that awareness comes choice. We can evaluate how useful each part is to us NOW, whether or not it was useful in the past, and choose whether we will hold that as a core part of our mindset now. We can try on different perspectives and assess what outcome that would bring for us and whether that would be a good outcome. We can clarify our core values that are most important to us, and understand how we express that in our lives, so we can choose behaviour and actions that are in harmony with what is important. We can then create a plan for how we will achieve that! When we change the way we look at things, the things change too. Call or email Sue if you would like to explore what you might do with coaching to explore your mindset and set yourself up for success. October 19, 2013 by Sue Mitchell, Aeona Limited. When you think of confidence, what comes to mind? What do you think of? What do you see in your mind’s eye? How do you relate to confidence for yourself? How important is confidence to you, in your life overall, and in your work? How consistent is your confidence? Does it change over time – in the longer term or from day to day or from situation to situation? What difference does having confidence or not having confidence make for you? the telling of private matters or secrets with mutual trust. The word confidence comes from the latin word confidentia, from confidere which means to ‘have full trust’. 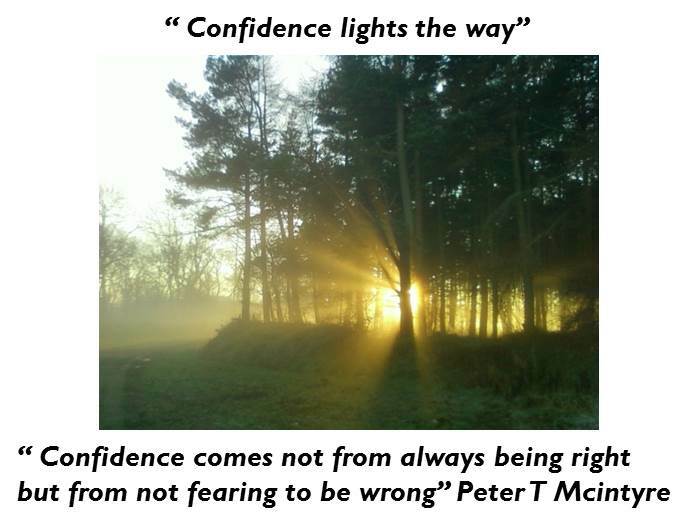 When we talk about having confidence or being confident, we are usually thinking of the third ‘feeling’ meaning – self-assurance arising from an appreciation of one’s own abilities or qualities. Self-confidence is an attitude which allows individuals to have positive yet realistic views of themselves and their situations. Our sense of confidence imbues us with the personal power to be all we can be – to do more, to do it better, to have a go at something new, to achieve our dreams and more. Confidence is the foundation for our success – in whatever way success is meaningful to us. Confidence makes the difference in life, as it gives us the means to be who we really want to be, to express ourselves with ease, to be comfortable with people and in ourselves, to stretch out of our comfort zone, to know that we CAN do what we want to do and to take the first step towards making it happen. Luckily everyone can learn confidence, though it is not just a skill you can learn by applying a set of rules. Confidence is an attitude or state of mind that sits at the very core of our being and transforms our life in a positive way. Confidence is the outcome of a whole lot of things including our experiences (and the way we think about them), personality, emotional well-being, self-awareness, and our thinking style which can include how we make decisions and solve problems or find solutions. Learning confidence is a journey about changing your state of mind by raising your awareness and changing the way you think, the way you see things and interact with the world. Learning confidence leaves behind the “I can’ts” and opens the doors to your brave new world full of “I cans” and possibilities, where you SEE and seize the opportunities that come your way. Learning confidence dares you to listen to your heart and tap into your motivation and ambition and only then let your rational brain work on how to achieve that. Confidence opens the way for ‘I will’, ‘I want to’ and ‘I like to’ and leaves behind the ‘shoulds’, ‘musts’ and ‘have tos’. Confidence lets you stop giving priority to your brain ‘rationally’ talking you out of what you want, to settle for an alternative option only because it is safer or expected of you or … the list can be endless and not always true! Don’t get me wrong here, I’m not talking about absconding from responsibility or taking on a self-centred hedonistic life style where all you think about is you and what you want. I’m talking about changing the way you think about your responsibilities so you want to do them and feel positive about them, rather than just complying and feeling you should do them but don’t really want to. Maybe that also involves learning the confidence to say no in a positive way. I’m talking about knowing yourself, assessing your strengths, your personal values and purpose and what you want from life and making sure you follow the road to make that happen by ensuring the things you do are in harmony with who you really are. Assess whether you are in the right job for you – does it or could it ever give you fulfilment? What do you need for fulfilment? What do you give and get from your relationships? Learning confidence gives you personal power to be yourself and let your own light shine. July 22, 2013 by Sue Mitchell, Aeona Limited. The New York Times published a fascinating article about research at Google on what makes effective managers. Although it was published a few years ago, it is still useful today. Google’s data showed that managers had a much greater impact on employees’ performance and how they felt about their job than any other factor. Poor managers are the biggest variable causing people to leave the company (the other two reasons people leave are i) are lack of feeling their work matters or a connection to the company’s mission and ii) not liking or respecting their colleagues). Google used to think it was vital that managers had deep technical expertise and be more expert than their team members. Their management philosophy was to ‘leave the engineers to get on with their stuff and they will ask when they need help’. BUT their in-depth data analysis showed that people valued managers MOST when they made time for them, listened and were consistent. Employees valued most their even-keeled bosses who made time for one-on-one meetings, who helped them puzzle through problems by asking questions, not dictating answers, and who took an interest in their lives and careers. They found that technical expertise is important but ranked last among Google’s eight key factors of great managers. Express interest in team members personally and in their success. Have key technical skills so you can help advise the team – but you don’t need to be as expert or more expert than the experts in your team! Have trouble making the transition to team / leader (from being an expert / individual contributor). Spend too little time managing and communicating. Google makes the facts known to their managers, so they know what works and doesn’t work. They don’t tell the managers what to do, managers decide for themselves. Google’s data for how to be a great manager in their company echo’s other research about what makes managers effective in other companies. These 8 rules are simple and probably applicable in most companies. If you can make yourself accessible, listen well and be consistent, and apply these 8 rules in the priority listed above, what difference will that make to your own and your team’s performance? Sue Mitchell email: coaching@aeona.co.uk telephone +44 1875 830708 or use the contact form below – please make sure you spell your email address correctly for me to be able to reply to you. December 31, 2012 by Sue Mitchell, Aeona Limited. Where we focus our attention influences the results we get – if we focus on the negatives, we tend not to notice the positives and often create situations that demoralise people. When we reward people with a positive response when something is done well or we like it, people usually want to continue that behaviour. When we are aware of something, we also pay it more attention. A classic example is when we bought a new midnight blue car, we thought there weren’t that many cars of this colour on the road, especially our model. Now, we see not only cars of this colour but also this model and colour everywhere! What do you want to be more aware of this year? What will you focus your attention on to bring you positive results in 2013?